It’s here today and gone tomorrow! I’m talking about the snow, of course - fat snow or thin snow, take your (snow) pick. Although other areas are still covered in the white stuff (two of the Darling Daughters have been in the thick of it. Literally) Mr B and I live in an area where the snow disappears almost as soon as it appears. So while yesterday we looked out on a White World and I was resolving not to set so much as a booted foot outdoors, today the grass was green, the sun was shining and I was off on the bus to buy February’s birthday cards. While arranging myself on my seat, I managed to drop one of my gloves on the floor where it was picked up by a Gallant Gentleman boarding the bus behind me. When I thanked him (I was well brought up, can’t you tell?) he remonstrated with me that to say thank you was to invite bad luck. I haven’t heard this one before; I know all about walking under ladders, spilling salt, breaking mirrors - all of which I try very hard not to do - but would it not seem so very rude not to say thank you in such circumstances? What should I have said instead, I asked the woman sitting opposite me? She shrugged her shoulders but then embarked on the subject of the weather, presumably in case I might think she was being unfriendly. Have you ever tried to buy a 90th Birthday Card with a slightly risqué message? I honestly don’t think they exist. One of my February cards is for a dear, long-time friend who looks out every year for a rude card from us. Mr B, in his card-purchasing days, used to take particular pleasure in choosing an Extremely Rude Card for our friend, knowing that the Birthday Boy would proudly display it on his mantelpiece, the ruder the better. Many’s the occasion I had to add a disclaimer inside so that our friend knew I had had no part in the choosing. It has become more difficult now that Mr B has been forced to hand over the task of choosing cards to Yours Truly because I feel honour bound to keep up the tradition but can no longer claim innocence / ignorance. 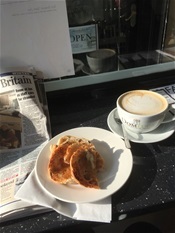 The Youngest of the Darling Daughters issued me with an order to find a café where I could buy a latte and a toasted tea cake while I was out. I am, as you all know, the Obedient Type so once I had finished all my shopping I headed into the Bay Tree Café where I managed to nab a seat in the window. This kind of Perch Placement is very important for we bloggers, as it provides additional opportunities to identify Blog-worthy incidents going on outside. You will therefore be fascinated to hear that I saw the Gallant Gentleman and his wife strolling along outside; I thought for a moment they might join me but they didn’t. Perhaps they had spotted me before I spotted them. When my sweet treats arrived, I sent a photo to the Youngest of the Darling Daughters. Oh, yes, I know - there are few things more irritating than people who take photographs of their snacks / meals / treats - but I was under orders wasn’t I, so I was merely providing evidence that (for once, Mr B would say) I had Done As I Was Told. “Wish you were here!” I captioned my photo. “Me too, me too!” responded my daughter. Guess who was on my bus on the way home? That’s right, the Gallant Gentleman and his wife. We nodded at each other like old friends.